 Ellok klass Re 460 029 typ SBB/CFF/FFS "Chiquita"
Ellok klass Re 460 029 typ SBB/CFF/FFS "Chiquita"
By buying this product you can collect up to 3328 bonuspoints. Ellok klass Re 460 029 typ SBB/CFF/FFS 'Chiquita', digitaldekoder, ljudmodul, längd över buffertar 21,3 cm, epok VI. Model: The locomotive has a digital decoder and extensive sound functions. It also has controlled high-efficiency propulsion, centrally mounted. 4 axles powered. Traction tires. The triple headlights and dual red marker lights change over with the direction of travel, will work in conventional operation, and can be controlled digitally. The headlights at Locomotive Ends 2 and 1 can be turned off separately in digital operation. The locomotive has long-distance headlights that can be controlled digitally. You can change between the Swiss headlight / marker light code and the white/red headlight / marker light code. The cab lighting can be controlled digitally. Maintenance-free warm white and red LEDs are used for the lighting. The locomotive has new, intricate single-arm pantographs. It also has separately applied metal grab irons. The cabs have interior details. Length over the buffers 21.3 cm / 8-3/8'. Highlights: New, intricate single-arm pantographs. Centrally mounted motor included. All four axles powered. Cab lighting. European and Swiss headlight / marker light code. 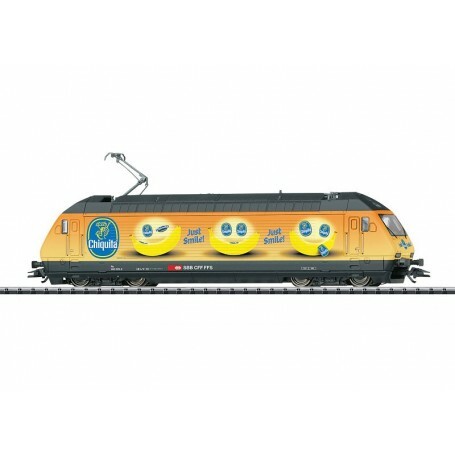 This model can be found in an AC version in the Märklin H0 assortment under item number 39465.